The Steven Kasher Gallery is proud to present Stephen Shames: Childhood and Youth. Since he began working, in 1967, childhood and youth have been the central concerns of Stephen Shames’ photography. Shames has published eight books largely concerned with youth in struggle. The exhibition will feature over 75 vintage prints made in the late 1960s through today. In 2004, Stephen Shames started a foundation to educate kids in Uganda. In 2008 Shames was hired by City of New York’s Human Resources Administration to photograph fathers and their kids for bus-stop billboards in the five boroughs. Shames writes: In a sense, my photo work has always been related to fatherhood and family. I had a rough childhood due to an abusive relationship with my dad. I search through photography for what I didn’t have as a kid with my own dad; love, support, encouragement, etc. In my early work, I explored abuse and neglect. In my later work, I create a world, a family I could not have as a child. My work is a healing process for me. 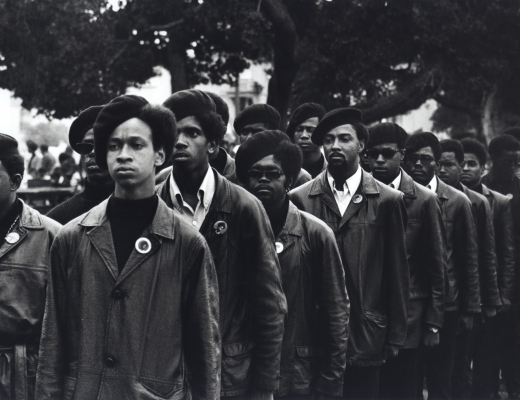 Some of my first photographs documented the Black Panther Party. My work with the Panthers was possible because of my relationship with Bobby Seale, who was like a father to me. Later when I started shooting the Bronx Boys and child poverty, street kids, and later Ugandan AIDS orphans and child soldiers, I became a father to some of these kids. I remain close to Poncho. I have known him for 25 years. I am a dad to him and he is my son. Now I am “dad” and “uncle” to 75 kids in Uganda. I not only photograph, but I started a foundation, LEAD Uganda, to put orphans and child soldiers into the best schools so they can become leaders. This closes the circle. Stephen Shames’ images are in the permanent collections of the International Center of Photography, the National Portrait Gallery, the Museum of Photographic Arts, the University of California’s Bancroft Library, and the Museum of Fine Arts, Houston. He has received awards from Kodak (Crystal Eagle for Impact in Photojournalism), World Hunger Year, Leica, the International Center of Photography, and the Robert F. Kennedy Journalism Foundation. Stephen Shames: Childhood and Youth will be on view January 22 through February 21, 2009. Steven Kasher Gallery is located at 521 W. 23rd St., New York, NY 10011. Gallery hours are Tuesday through Saturday, 11 to 6pm. For more info or press requests please Kat Jones at 212 966 3978 orkat@stevenkasher.com.